Here's a little sneak peek of some things I'll be sharing next week! Tutorials for making lacy accents (from a very unusual product) and handmade embellishments as well as a GIVEAWAY. You'll want to stay tuned and stop by my blog again the first week of April for all this and more! My (non-cardmaking) sister-in-law sent me the coolest one-layer long card for my birthday last year, which (of course) I used for inspiration in my handmade cardmaking! I gently undid the envelope and traced it off for a pattern which I'm sharing below. I use a 8.5 x 11 stack of thin designer paper I bought a long time ago for making my envelopes. The paper isn't really my style anymore, so rather than throw it away, I turn it into envelopes for my odd shaped cards. I usually add a little something to them to make them coordinate with the card. I've had a lot of fun playing along with the Coffee Lovers Blog Hop this week. Today's card is a super feminine teacup card full of roses and lace! Using the Dear Jane Paper Stack (from DCWV) made coordinating all my layers easy! I even used a cut-out cameo from the pack to embellish the inside of the card. 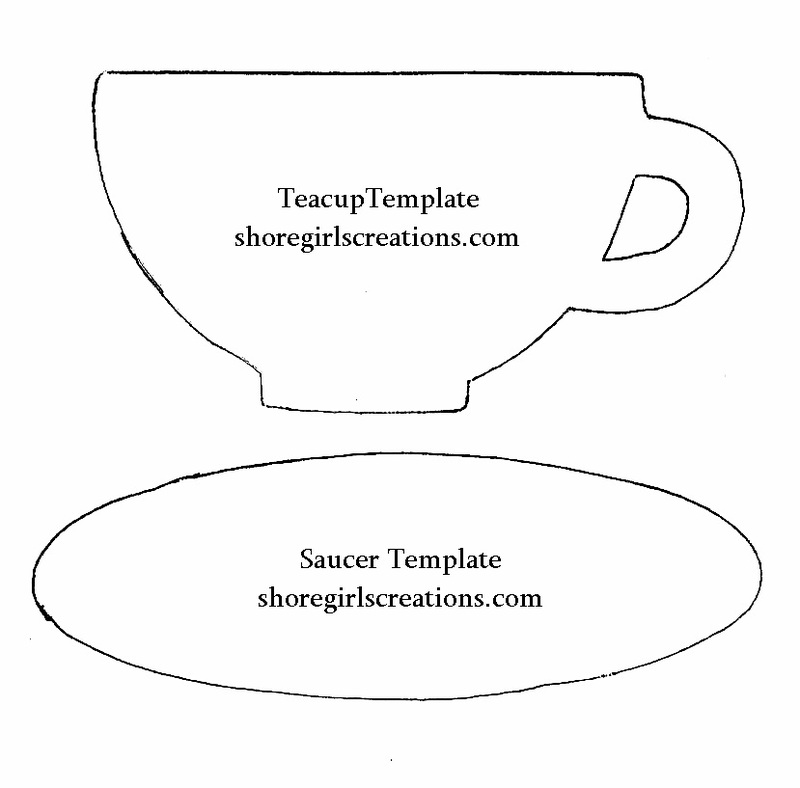 To embellish my hand-cut teacup and saucer (template below), I inked the edges with distress ink and layered lace under the die cut roses and added a tiny teabag tag. Today's card features ditial images from two Etsy shops and Verve Stamps. 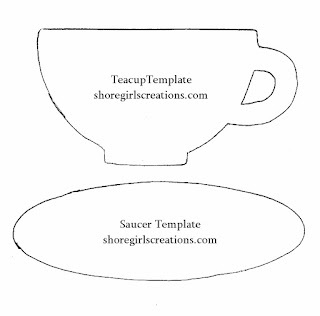 To create my giant coffee cup I layered a digi from Emily Peterson Studio onto a shabby wood background from Iralamijashop. I used two images from Verve's Rise and Shine set - a sentiment on the outside of the card and a coffee mug inside the card. 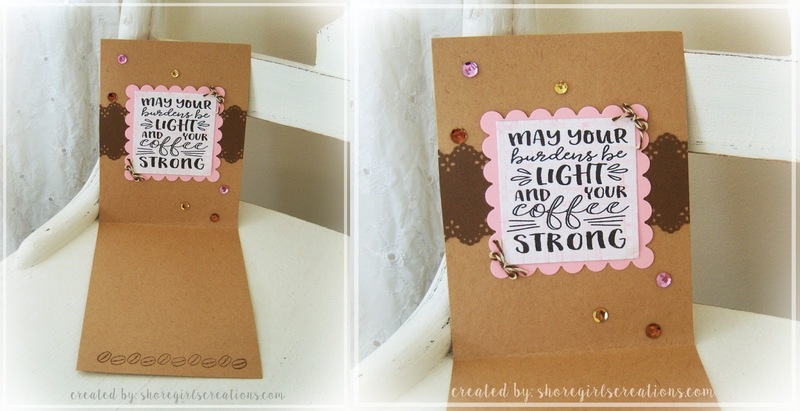 Here's another Coffee Lover's Blog Hop creation I made. This time I used tea as my inspiration and created a decorated pretty gift ensemble for gifting some yummy Jasmine tea! To decorate my bag I folded a paper doily across the top and tied it shut with Baker's Twine wrapped around the bag several time. I decorated my mini wooden clothespin with washi tape and a tiny crocheted heart. The tag is made of Kraft cardstock embossed with the Victoria embossing folder (Provo Craft) and lightly inked with white pigment ink. I l cut my FREE printable sentiment (from Verve Stamps) with the Spellbinders Labels One Nestabilities and layered it on coral cardstock. Next I stamped a tea bag (Latte Love - Fiskars) over it in abandoned coral distress ink (Tim Holtz). The large bloom is made with my Paper Blossoms punch, coral cardstock, abandoned coral distress ink, a pearl, Petaloo lace, and the frond punch from Martha Stewart. Through the punched hole at the top, I tied a bow in brown Baker's Twine. 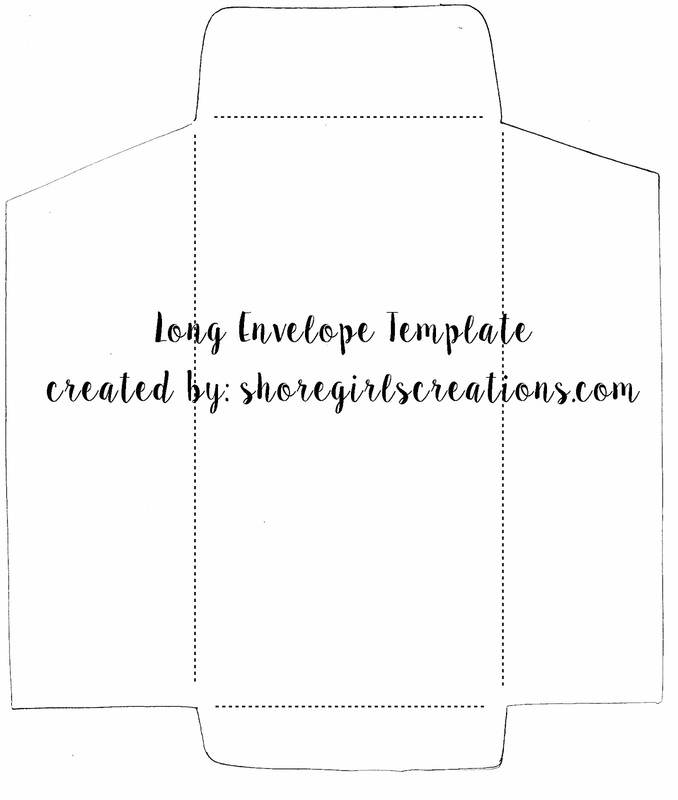 Today's Cropstop blog cards are pretty quick and easy to make and full of texture and color!! To create the background for these cards: I cut a piece of watercolor paper to size and tapped out just a bit of Ken Oliver's Color Bursts in Ultramarine Blue, Chartreuse, and Fuchsia. I spritzed it with water from my mini mister and heat set the colors with my embossing gun. Note: I found that alternating spritzing with water and heat setting let me control the amount and depth of color I wanted. Less spritzing = less color --- more spritzing = deeper color. After the colors were dry, I used my Tim Holtz stencil (Watercolor Stamp and Stencil Set) and applied a layer of white gesso. The card fronts are matted on black cardstock to make them "pop" against the white backgrounds. To finish them off I added butterflies (Tim Holtz - Watercolor Stamp and Stencil Set) stamped in mermaid lagoon, twisted citron, and abandoned coral distress ink. For extra sparkle, I applied a fine layer of white glitter over top before fussy cutting and matting on black cardstock. The friendship sentiment (Stampin' Up) is stamped in black soot across the front of the card. I'd love to see how you use color bursts or gesso, so stop by the CURRENT CHALLENGE and link your projects using Cropstop products! Hope to see you there! Here's another coffee themed craft I made for the Spring Coffee Lovers Blog Hop. To make my little treat bags I up-cycled some kraft colored coffee filters that I found at a thrift store. Here's a view of the back of my coffee filter so you can see how I folded my filter to form my mini treat bag. I embossed my little pouches with the Script Embossing Folder (Provo Craft), and added a bit of heavy gesso and distress ink (Brushed Corduroy). Across the front I added a piece of torn dictionary page, an embossed piece of kraft cardstock, and a twine bow with a wooden button center. The Spring Coffee Lovers Blog Hop was the inspiration behind this coffee themed shaker card. I created the frame for my shaker by stamping my pink cardstock with a plaid background stamp in versamark watermark ink and lightly rubbing chalk over it. The coffee bean panel was created the same way - only with coffee bean stamps and brown chalk. I used a free coffee themed printable from Verve Stamps to decorate the inside of my card. I just added some Mini Crochet Lace Bowls to my Etsy shop. These little bowls fit so many different decorating styles: Rustic Farmhouse, Shabby Chic, Cottage Charm, Primitive, Country, etc. By switching out fillers you can use them in any seasonal decor. Also, great for parties, weddings, showers. Stop by Our Homemade Blessings today and check out these and other home decor items! Today I'm sharing a CAS sympathy card I made earlier this year. I wanted to add some 3D flowers to that stamped image so I layered the flowers from two different border punches to create my mini blooms. So....the current challenge on Less Is More got the wheels of my brain turning on how to use Washi Tape in unique ways and out hopped these Easter bunny cards! These mini cards were so simple and fun to create! Just a few pieces of washi tape and a sharpie marker! I stamped the matching sentiments in Tim Holtz Distress Inks and added some tiny flowers to the Baker's Twine bows for a little extra "bling." These little cards are easy enough that even your kids, grandkids, nephews, nieces, Sunday School class etc. could enjoy making them! The "Less Is More" Challenge blog is featuring Washi Tape this week. In all honesty, clean-and-simple (CAS) cards are very hard for me. I'm a pile-it-on kind of crafter, but it's fun to branch out once in a while and try something outside our comfort zone. To create my cards, I cut a white panel slightly smaller than my card and distressed the edges with scissors. Next, I applied washi tape to some white cardstock and then die cut it using my Birds On a Wire Die (Spellbinders). I layered that on an embossed strip (Circular Grid Border - Anna Griffin), and used my Martha Stewart Scoring board and scored a line on either side. The sentiment comes from the Hampton Art set, "Home Tweet Home." I finished off the front with three brightly colored sequins. I also decorated the inside with the same stamp set, added some more washi tape and a die cut from Momento. Happy First Day of Spring!! 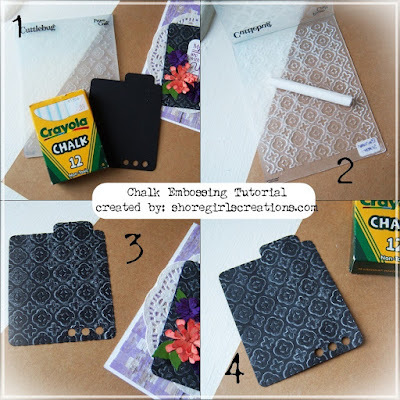 Today I'm sharing a floral card that features a chalk technique I recently experimented with. Here's a mini tutorial to show you how I created the chalkboard look on this card. Step One: Gather your supplies - Black Cardstock, Chalk, an Embossing folder of your choice Step Two: Rub the chalk on the negative side of the embossing folder Step Three: Insert your black cardstock and emboss (photo #3 shows you what it looks like after embossing) Step Four: Rub your finger over the chalk to blend it into the cardstock and create a chalkboard look over your embossing. To create my floral card, I chose to die cut my black cardstock with the Tabbed Journal Die from Couture Creations, and embossed it with the Moroccan Screen embossing folder (Cuttlebug). I stamped a sentiment from the All Occasions Sentiment set (Heartfelt Creations) in Seedless Preserves Distress Ink and cut it out using the Labels One Nestabilities from Spellbinders. Using the Tiny Tattered Florals die set from Tim Holtz I cut three pretty blooms and inked their edges with seedless preserves/abandoned coral distress ink. I spritzed them with water from my mini mister to help the colors run a bit and heat set them with my embossing gun. Holding two pieces of burlap string together (pink and purple) I tied a pretty bow and glued a purple button to the center. 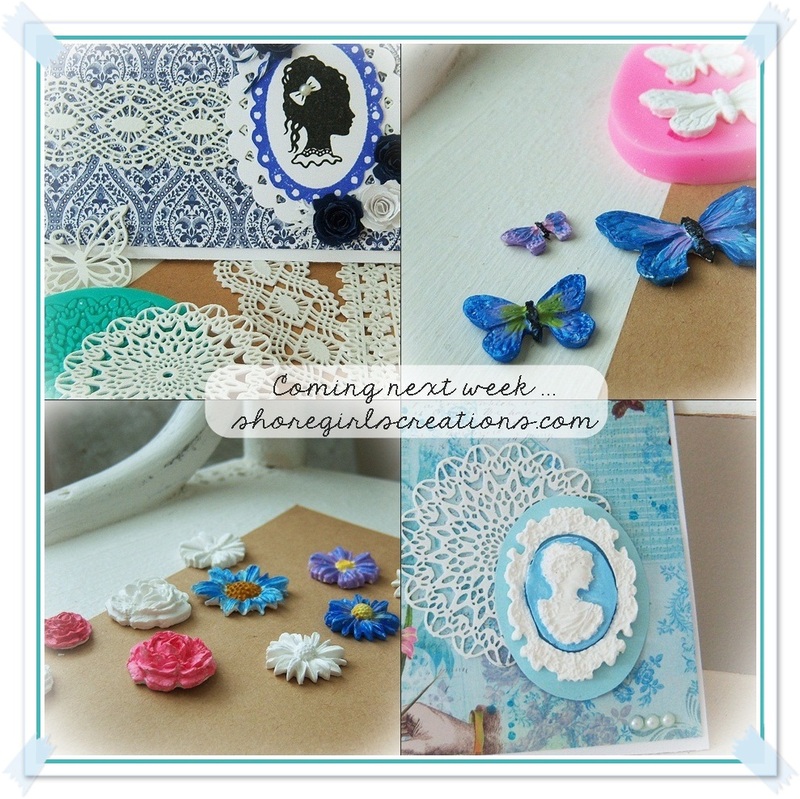 The background features designer paper from the Barnwood Pretty Stack (The Paper Studio) and a small paper doily. I adhered four tiny pearls to the bottom corner to complete this card. 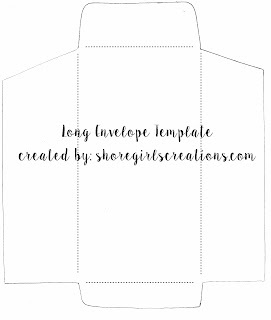 I'd love to see your take on this fun technique, so stop by the CURRENT CHALLENGE and link up your projects using Cropstop products! Since my last set of nests (below) sold out so quickly, I decided to make some new ones with a spring theme. I love how bright and cheery these turned out with the colored eggs on a nest of Spanish moss tucked in a vintage tart tin. I added a removable chalkboard style sign using my Labels Four Nestabilities (Spellbinders), pastel papers, alphabet punches, some twine, and the Tiny Tattered Florals Dies from Tim Holtz. These pretty little nests are perfect for adding to your spring or Easter decor and were a lot of fun to make!